The full birth name of this Spanish Maestro was Manuel María de los Dolores Falla y Matheu. He was born in Cadiz on 23 November 1876 to his parents José María Falla y Franco and María Jesús Matheu y Zabal. His mother was, along with his grandfather, one of his early music teachers. At the age of nine Falla began piano lessons with Eloísa Galluzo, but the lessons ended abruptly when she entered a convent - the Sisters of Charity - to become a nun. A few years later in 1889 he continued piano lessons with Alejandro Odero, and studied harmony and counterpoint with Enrique Broca. 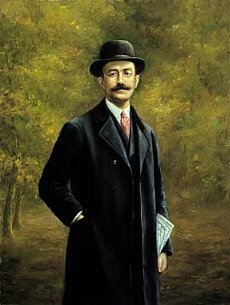 At the age of 15 years Manuel de Falla became interested in literature and journalism and founded two magazines: El Burlón and El Cascabel. 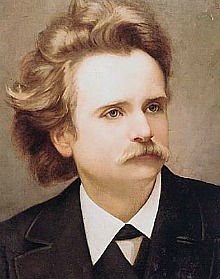 However two years later, after witnessing a concert of the Norwegian composer Edvard Grieg's works, he felt inspired and later reminisced that at that time he felt that "my definitive vocation is music". In the year Falla turned 20 years of age he relocated to the capital city of Spain, Madrid, where he attended the Real Conservatorio de Música y Declamación. At the Conservatorio he studied piano with José Tragó (a colleague of Isaac Albéniz), and composition with the widely esteemed Felipe Pedrell. 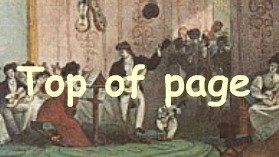 Falla enjoyed the chamber music that was hosted by Salvador Viniegra, and dedicated his Melodia for cello and piano(1897) to him. It was at this time that he began prefixing his surname with "de", and hereafter was known by this name. Around 1900 he premiered the piano piece Serenata andaluza y Vals-Capricho at the Ateneo de Madrid ("Athenæum of Madrid" - a private cultural institution). His family's precarious financial position at the time necessitated that Falla begin teaching piano lessons. Pedrell had a profound influence - as he had on many other of his students - on the young Falla. The composition teacher advocated the use of folk music as a source of inspiration: Falla became interested in native Andalusian music, and was to use many elements such as flamenco's cante jondo in his compositions. Subsequently he began writing in the Spanish opera idiom known as "Zarzuela", and his Los amores de la Inés was premiered on 12 April 1902 at the Teatro Cómico de Madrid. The following year Falla composed and performed his Allegro de concierto, as a competition piece for the Royal Conservatory in Madrid; the first prize was awarded to fellow Spaniard Enrique Granados for his piece of the same title. Falla's first major work was a one-act opera La vida breve ("Life is Short", or "The Brief Life"). The opera was written in 1905 in collaboration with the librettist Carlos Fernández Shaw, and with it, in a competition hosted by the Royal Academy of Fine Arts of San Fernando, he won first prize. However, nobody in Spain was interested in staging the opera, and so the composer sought better prospects in neighbouring France, where, in 1913 the opera was finally premiered at the Casino Municipal in Nice. Falla had moved to Paris in 1907 (at the advice of fellow musicians Joaquín Turina and Víctor Mirecki Larramat) where he met many influential composers such as Impressionists Maurice Ravel, Claude Debussy and Paul Dukas. In 1908 King Alfonso XIII enabled him to stay in Paris by awarding him a royal grant, and thus he stayed in the French capital while he finished his Cuatro piezas españolas. The nocturne for piano and orchestra Nights in the Gardens of Spain(1916). El amor brujo (The Bewitched Love, 1915) - a ballet which includes the ever popular Danza Ritual Del Fuego (Ritual Fire Dance). The ballet El sombrero de tres picos (The Three-Cornered Hat, 1917) - set design and costumes by the famed Spanish painter and sculptor Pablo Picasso. From 45 to 63 years of age Falla resided in Granada, Spain. Here, along with the poet Federico García Lorca, he organised the Concurso de Cante Jondo(1922) in an attempt to conserve the ancient art of Andalusian song and flamenco. Two important works composed in the city included the puppet opera El retablo de maese Pedro (Master Peter's Puppet Show - an adaptation of various episodes from Cervantes’s Don Quixote, 1923); and a harpsichord concerto, the first written for the instrument in the 20th century. Both works were written with the acclaimed harpsichordist Wanda Landowska in mind, and Falla digressed from his typical Spanish folk influences for these works, preferring to explore elements of Stravinskian neoclassicism. Manuel de Falla also began work on a large-scale orchestral cantata while living in Granada. Atlántida (Atlantis) is a canata based on L'Atlàntida written by Jacint Verdaguer: A mythological story in which the submersion of Atlantis created the Atlantic ocean, thus separating Spain from Latin America; the story then goes on to claim that the later discovery of America was a reunification of the two which had always belonged together. The composer regarded this as his most important musical work, however posterity has not agreed with his opinion and performances of Atlántida are very rare. As previously mentioned Falla collaborated with the poet Federico García Lorca: in july 1936 the Spanish civil war broke out and Lorca was targeted for his liberal views. Although Falla attampted to save his friend, Lorca was executed by Nationalist militia in August. Following Francisco Franco's victory in the civil war Falla left Spain for Argentina in 1939, where he lived out the rest of is life in exile. In Argentina Falla continued work on Atlántida (Falla did not complete the work by the time of his death, and the orchestration was completed posthumously by Ernesto Halffter) and also premiered the work Suite Homenajes in Buenos Aires in November 1939. Meanwhile back in his homeland in 1940, Falla was named a Knight of the Order of King Alfonso X of Castile; Franco's government tried to lure Falla back to Spain with the offer of a large pension, the composer steadfastly refused to return. The self-exiled composer spend some time teaching in Argentina, where amongst his notable pupils was the fellow country woman Rosa García Ascot. His health began to decline and he retired to a villa in the mountains where he was tended by his sister María del Carmen de Falla. On the 14 November 1946, Manuel de Falla died of cardiac arrest in Alta Gracia. 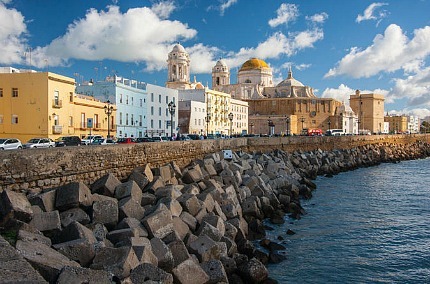 A year later his remains were returned from exile back to his homeland, where he was entombed in the Cádiz cathedral. One of the lasting honors to Falla's memory is the Manuel de Falla Chair of Music in the Faculty of Philosophy and Letters, in the capital's Complutense University of Madrid. 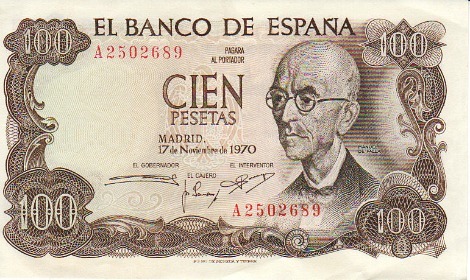 For a period his image appeared on the Spanish "100 pesetas" bank note. He never married and had no children. Find your favourite Manuel de Falla Sheet music at this page!